The shapes of distributions have names by which they are known. 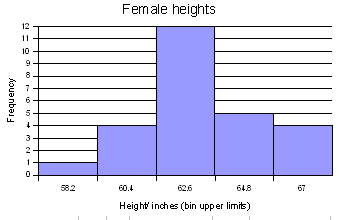 One of the aspects of a sample that is often similar to the population is the shape of the distribution. If a good random sample of sufficient size has a symmetric distribution, then the population is likely to have a symmetric distribution. 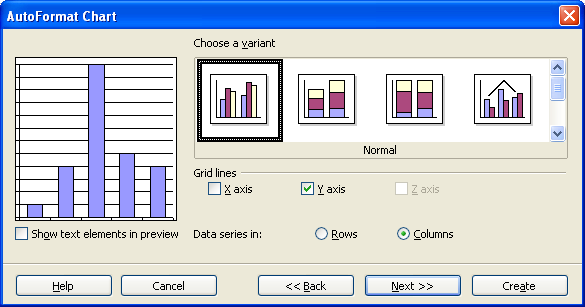 The process of projecting results from a sample to a population is called generalizing. Thus we can say that the shape of a sample distribution generalizes to a population. 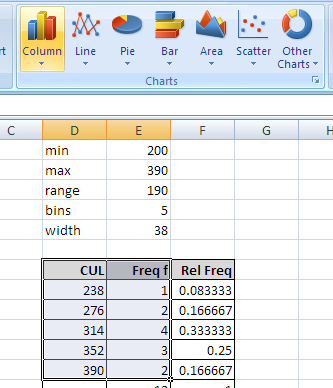 Select both the column with the class and the column with the frequencies. 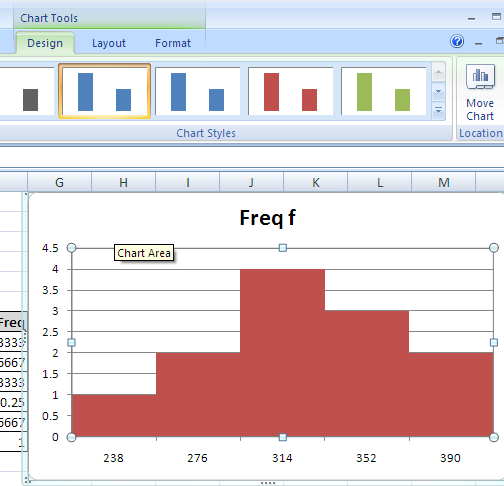 Click on the chart wizard button and then drag the mouse to place and size the histogram. 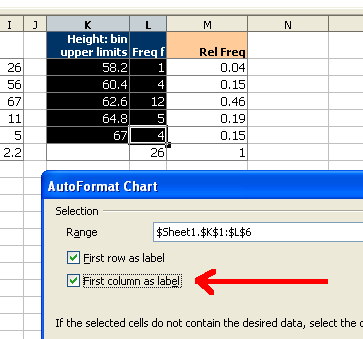 At the first dialog box be sure to click on the "First column as label" check box as indicated by the arrow in the diagram below. For the next two screens simply click on "Next"
On the next screen fill in the appropriate titles. The legend can be "unchecked" as seen below. When done, click on Create. 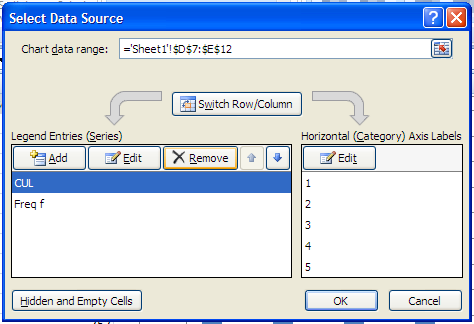 Double click any column to open up the data series dialog box. Click on the options tab and set the spacing to zero. 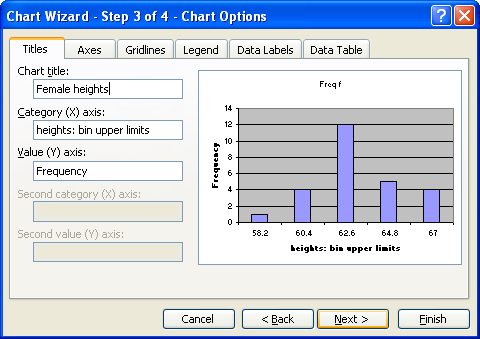 The chart wizard for OpenOffice.org 3.1 running on Ubuntu 9.10 will not produce a two-dimensional column chart from a "split selection." This complicates producing a relative frequency chart. 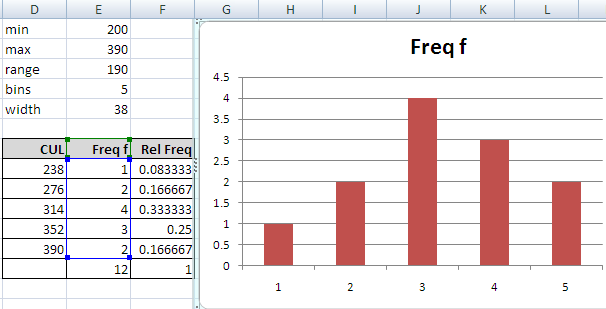 To produce a relative frequency chart, select all three columns and then delete the frequency column. 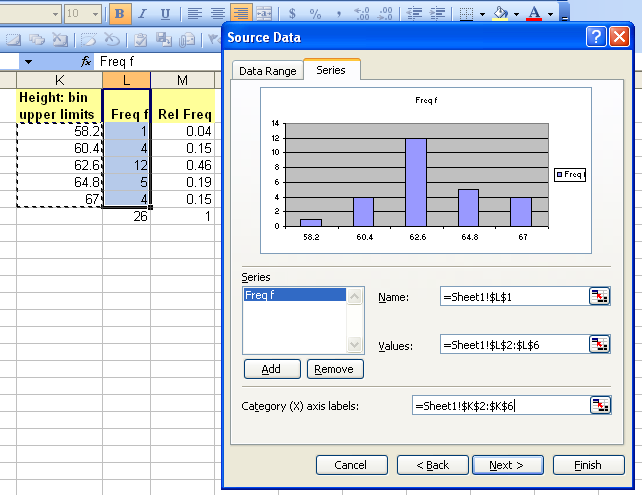 In step three, remove the frequency series to chart only the relative frequency. 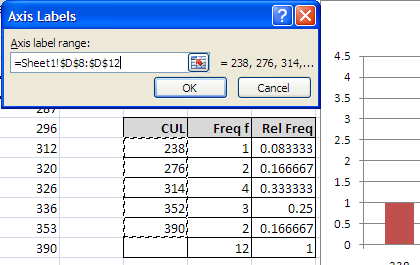 Select ONLY the column with the column with the frequencies. Click on the chart wizard. 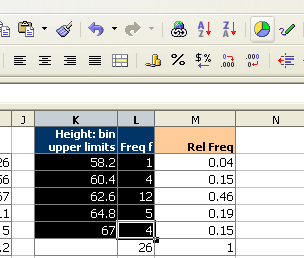 Select the class upper limits by dragging with the mouse. Click on next when done. Fill in the appropriate titles and then click on finish. 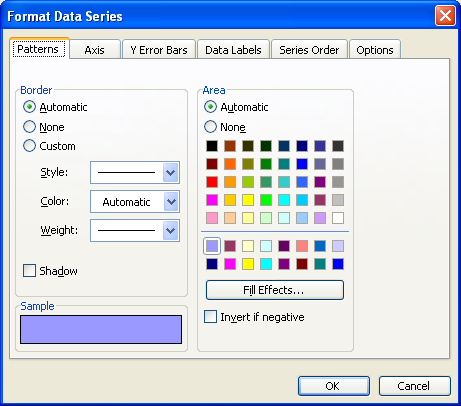 Double click any column to open up the Format Data series dialog box. Click on the options tab and set the gap width to zero. 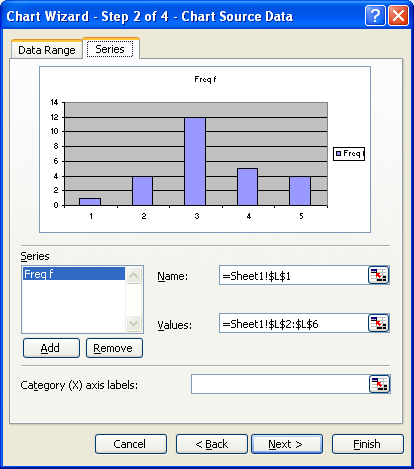 Excel 2007 is vastly different from earlier versions of Excel. The differences are beyond cosmetic and involve a fundamental shift in the philosophy, the gestalt if you will, of the interface. The difference is so radical from that of OpenOffice.org 1.0, 2.x, and 3.x that this author's recommendation is that one should avoid using Excel 2007 if one uses OpenOffice.org in the classroom. Note these examples use different data than the examples above. The original data derives from speed of sound measurements made by the physical science class. Fundamentally the program violates the old precept of reducing the number of modalities for a user interface. These are where the user interface shows and hides menus according to a mode setting. Office 2007 turns this on its head and is all about modes. 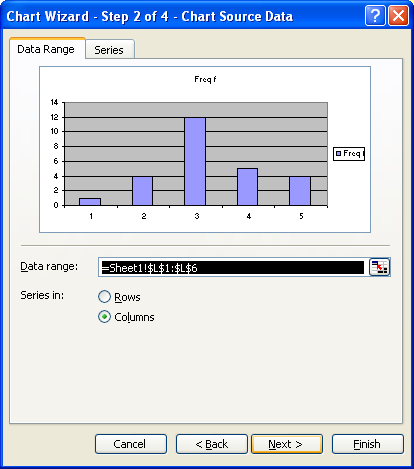 The program opens in the "Home" mode, a basic editing mode. 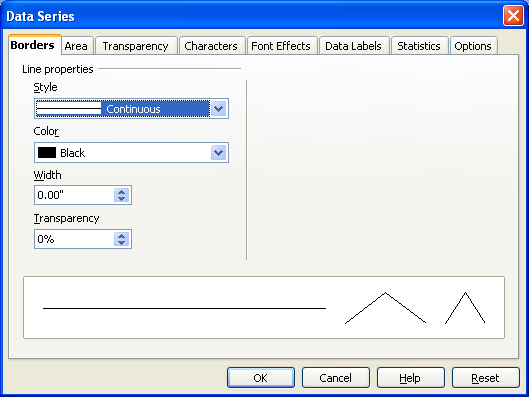 The main menus are replaced by a structure called "the ribbon" seen in the image below. 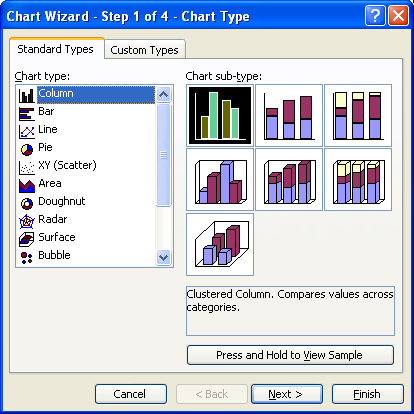 In the home mode the chart wizard is hidden from view. Click on the Insert tab on the ribbon. 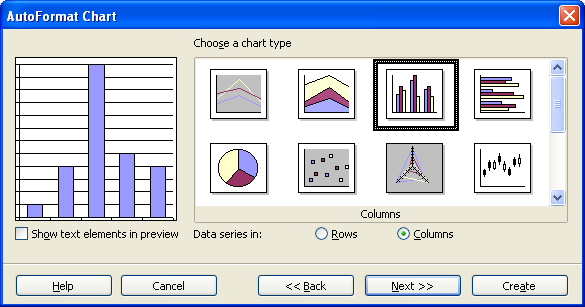 The charts section the ribbon is horizontally compressed in the image above. 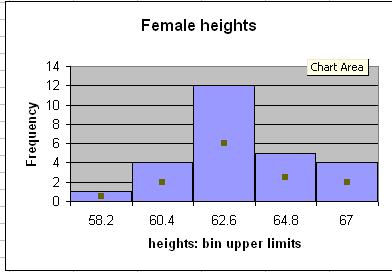 The chart section usually appears as follows. 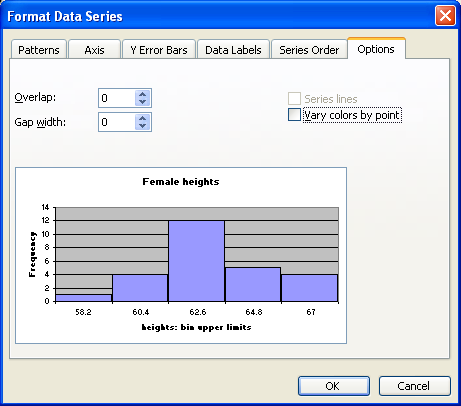 Select the data to be charted in the histogram, and then click on the column button. 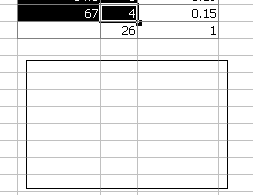 Select data and then column button. 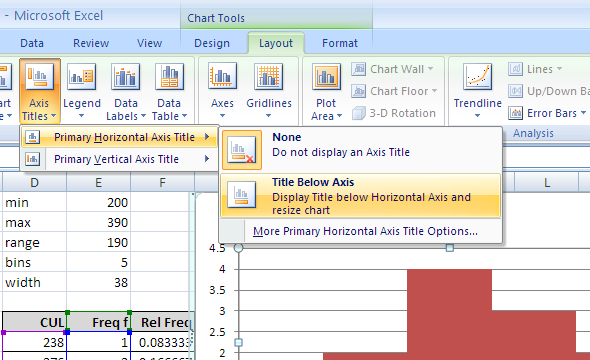 Right click on the chart to pop-up the chart context menu. 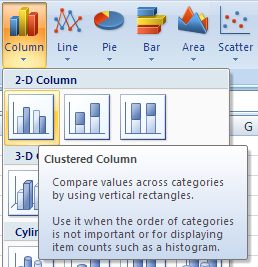 Choose "Select Data"
Remove the class upper limits (CUL) item from the Legend Series column. 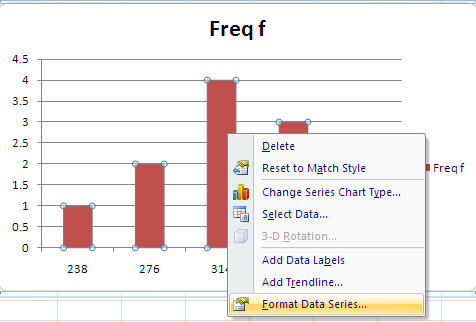 Click on "Edit" in the Horizontal (Category) Axis Labels column. 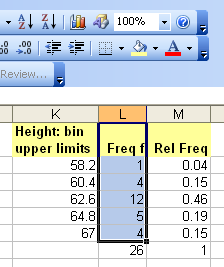 After clicking "Edit" the screen highlights the existing frequency column. Select the class upper limits (classes). Click OK.
Click OK again. 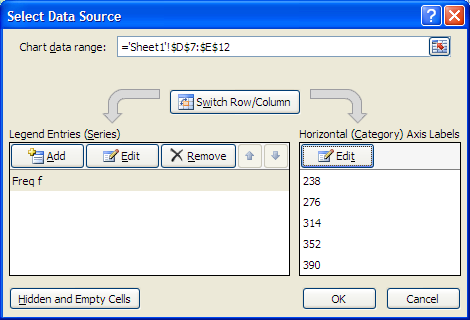 To set the gap width (spacing) to zero, right-mouse click on the series and choose Format Data Series. 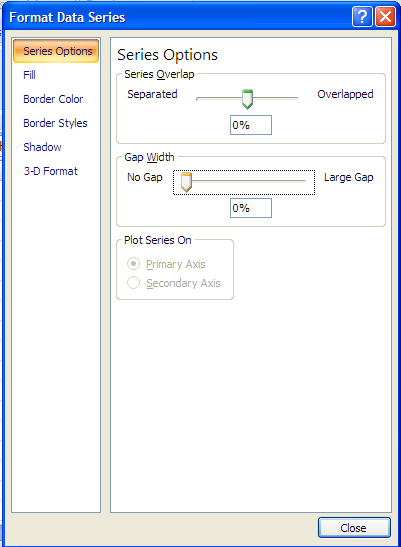 Set the gap width to zero. 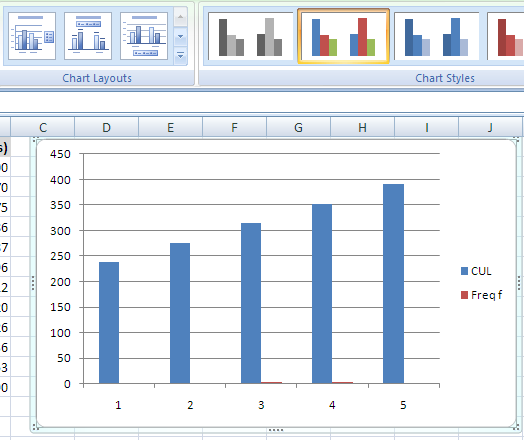 The result is a tad cartoonish - borderless columns - but that is a default style for Excel 2007. One can delete the legend, but x and y axis labels are usually necessary. Adding these is possibly the most non-obvious step for an OpenOffice.org or Excel 97/2000 user. 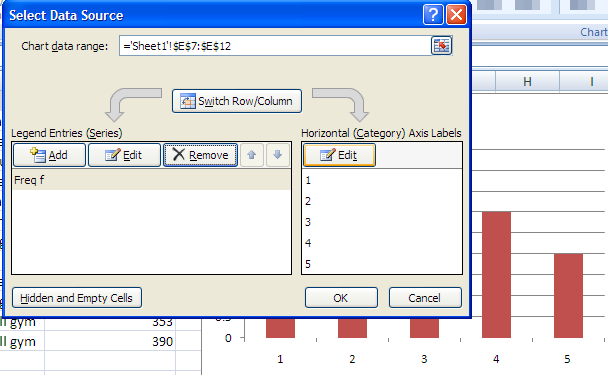 Note at the top of the Excel screen that there is a tab marked "Design". The two words to the right are also tabs, camoflaged to not look like a tab. Click on the camoflaged Layout tab. 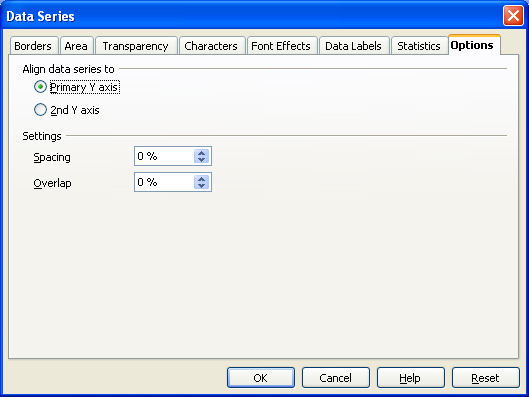 Now select Axis Titles: Primary Horizontal Axis Title: Title Below Axis sub-sub-menu. 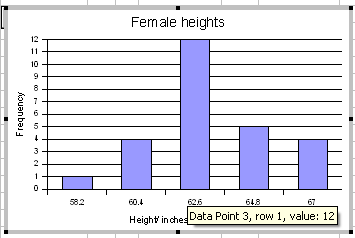 This adds an x-axis label which one can then edit. 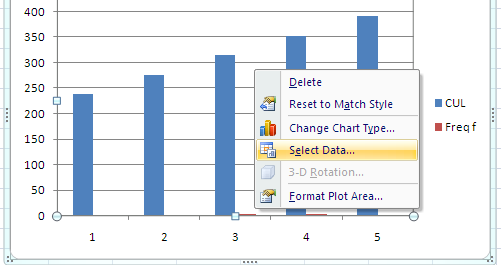 To obtain a y-axis label, select Axis Titles: Primary Vertical Axis Title: Rotated Title. This will add a y-axis title. Edit that title.